X-Large - $49.99 Only 9 left! Who's the beefcake? You might not be the sharpest tool in the shed, but that's no reason you can't put your good looks to work and get a job at the Department of the Metaphysical Examination. Errr... that name is a handful, let's just call them the Ghostbusters! You can become the receptionist, and while you learn to work a phone and how to say hard-to-pronounce words, you can have the signature look of the 2016 Ghostbuster crew when you show up in this authentic movie costume. This costume has the signature touches from the climactic scenes of the film. 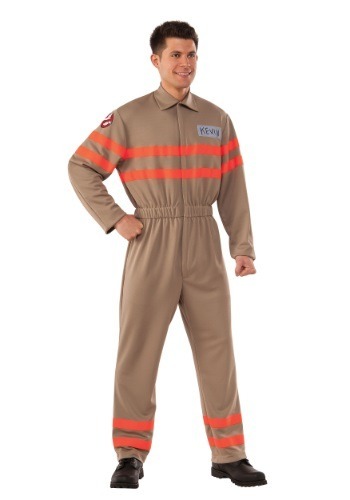 Styled as a replica jumpsuit, it has details like orange horizontal striping, a logo patch on the right sleeve, and a "handwritten" nametag patch on the chest that looks suspiciously like duct tape. Pick up a pair of frame glasses to match your good looks, and we're sure you'll look just like actor Chris Hemsworth! You can use this costume to complement your lady friends dressed up as the paranormal team for an awesome group theme, or team up with your favorite lady as her favorite character for an awesome couples look. (We hope she wants to be Jillian! Those gadgets are off the hook!) Whatever kind of adventure you have planned for your costume fun, we're sure there's not going to be any ghosts trying to gain control of your body!